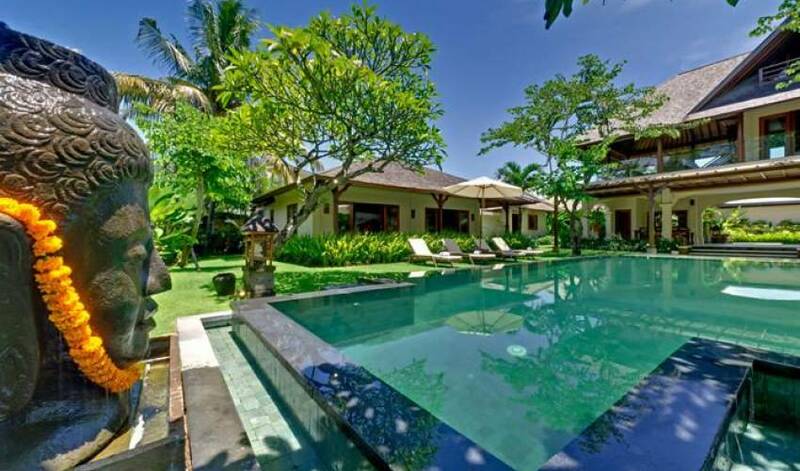 Absorb the energy and be soothed by the serenity of the Island of Gods in exotic splendour at Villa Asmara. This enchanting rural sanctuary overlooks the rice fields and rugged shores of the sleepy village of Cemagi that worships its very own sea temple, Pura Gede Luhur Batungaus. 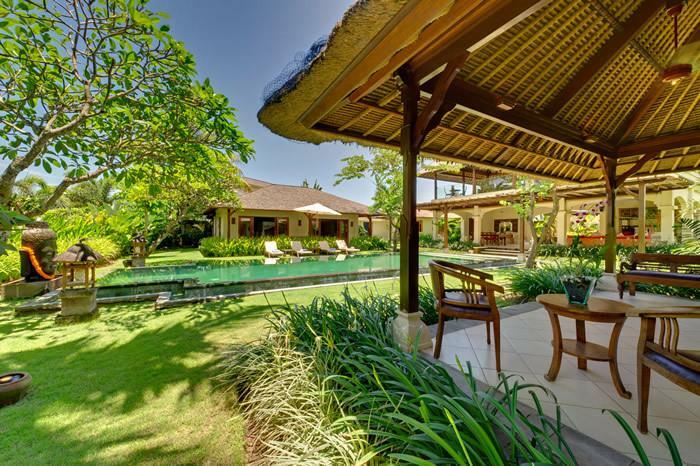 Featuring an open-sided lounge and dining room, large swimming pool, games room, media room and four spacious bedrooms with ensuite garden bathrooms, this fully staffed villa is the ideal choice for families and friends craving peace and privacy. 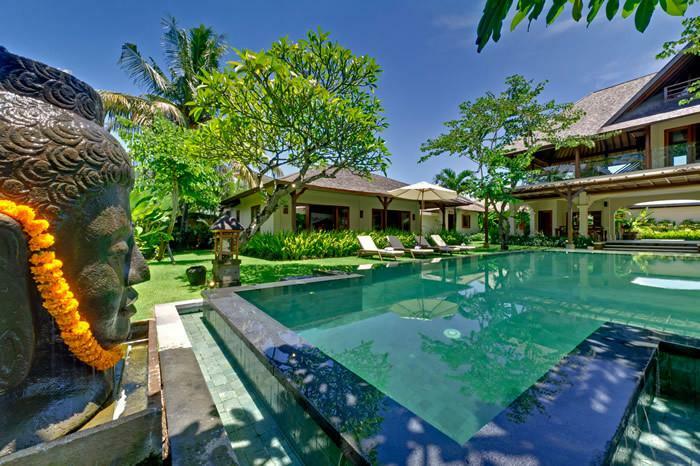 Perhaps it’s the large wise Buddha gazing across the gorgeous green-stone swimming pool, or the sound of crashing waves in the distance, or the exotic tropical gardens, but one thing is for sure: you can’t help but feel the warm and positive energy that embraces this villa. 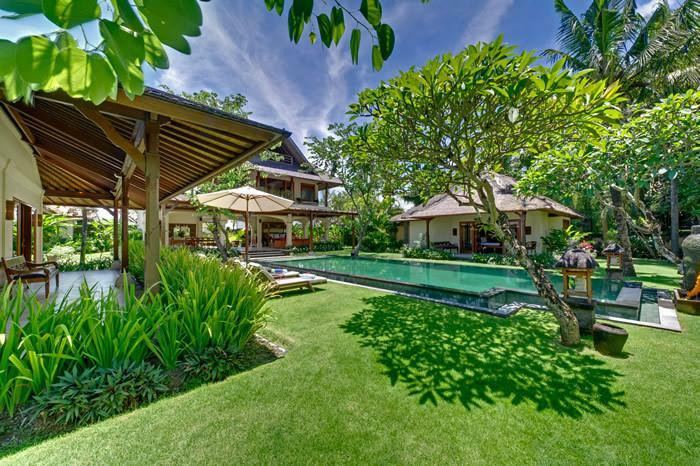 Set snugly between the beach and the terraced rice fields of Cemagi on Bali’s south-west coast, this four-bedroom ocean-view villa keeps you cool and comfortable at the same time. 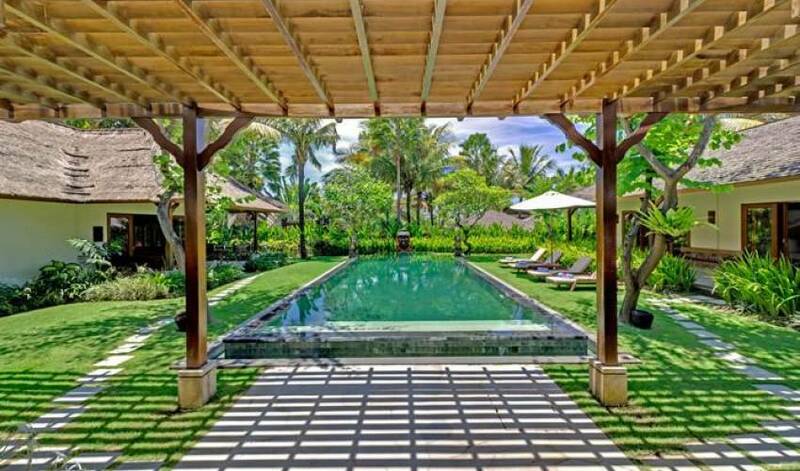 Marrying classic Balinese architecture with the comforts of modern living, guests are treated to a beautiful and luxurious home in a serene and peaceful environment. With stylish air-conditioned bedrooms and ensuite bathrooms hidden under traditional alang-alang and ironwood roofs you’ll be guaranteed a blissful night’s sleep as soon as your head hits the pillow. Those wishing to expend a bit more energy can notch up some laps in the pool, play a match on the tennis court, sink some balls on the billiard table or pedal their way through the neighbouring rice fields. 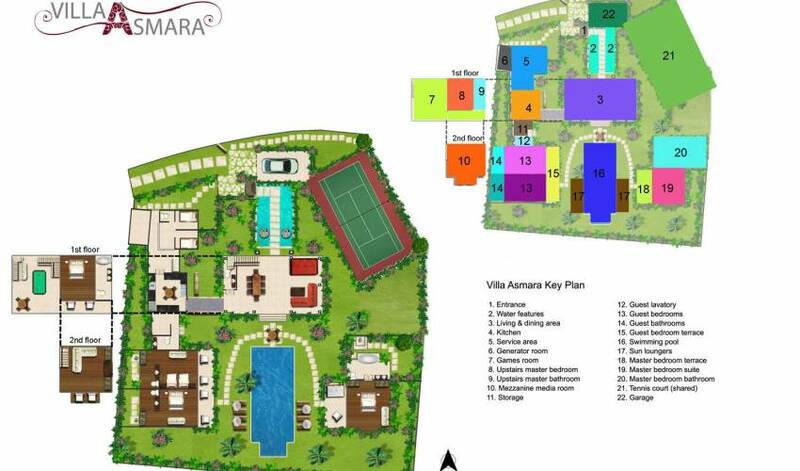 Not only will you fall in love with the villa, you’re likely to become quite attached to its staff too. From poolside cocktails to five-course dinners served by your very own villa attendants, all you need to do is lie back and relax. There’s even a car and driver waiting for when you’re ready to explore. 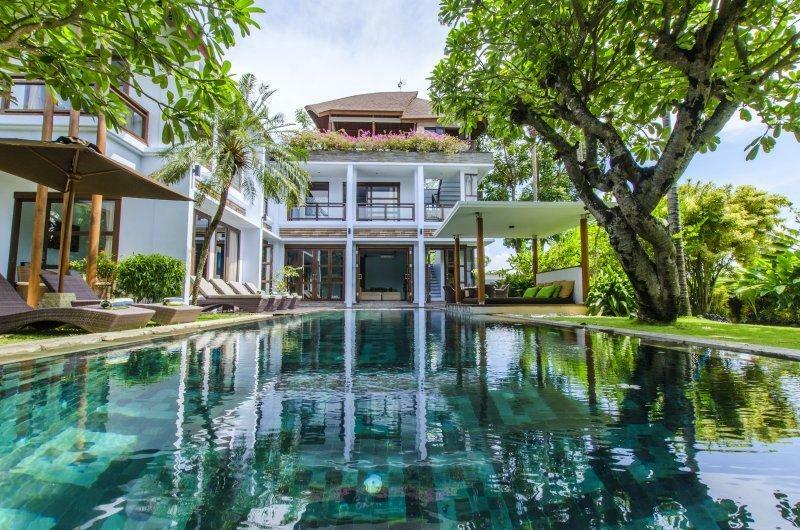 Whether you want to rekindle your spirits, reconnect with family, inject some romance or simply indulge in sheer luxury, this villa will make your wishes come true. 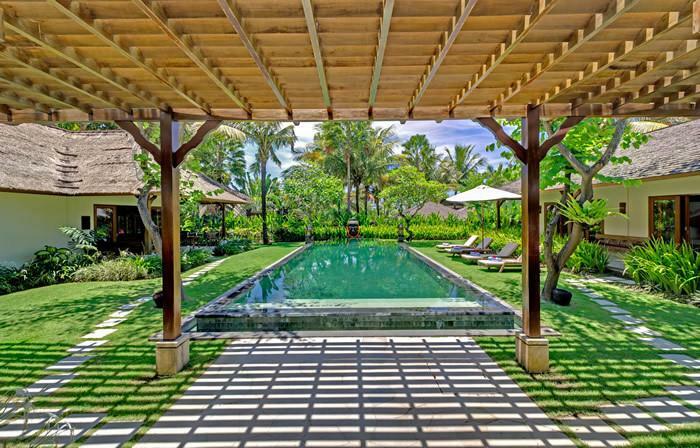 The energy and ambiance of this villa is evident from the moment guests enter the compound through the traditional Balinese doors and cross the Palimanan stepping stones over the tranquil fish pond. From here, the living pavilion overlooks the 12-metre green-stone swimming pool, at one end of which a large carved stone Buddha evokes a deep sense of calm. The three-storey living pavilion comprises a lounge and dining room at ground level, games room and master bedroom on the first floor, and a media room cosily housed under the soaring eaves of the roof space. 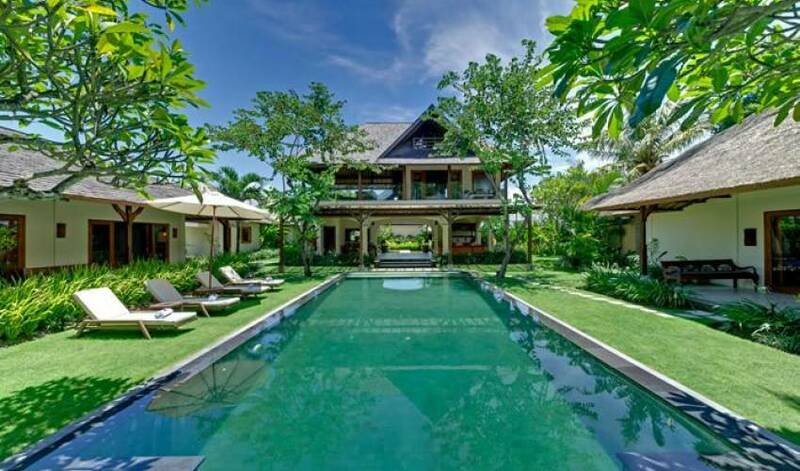 A second master suite occupies a stand-alone poolside pavilion, opposite which lie the two guest bedrooms. The open-sided lounge area with its soft cream arches is perfect for family and friends to enjoy a drink before dinner. 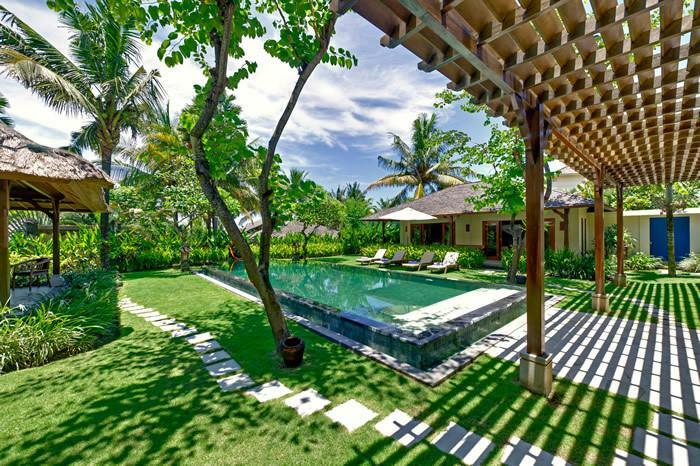 A large red L-shaped sofa and an antique Javanese daybed beckon guests to recline in style as they are cooled by ceiling fans or the gentle ocean breeze. Come dinner time the eight-seater solid teak dining table is ideal for enjoying a home cooked meal prepared by the chef in the nearby kitchen. For those that wish to cater for themselves, the kitchen is fully equipped with stainless steel appliances, black granite worktops and a four-seater marble dining table for casual dining. Above the lounge is the games room, with a glass balustrade to optimise views of the pool, ocean, rice fields and mountains. Enjoy a game of billiards here at dusk – a comfortable sofa is provided for onlookers. For card or poker enthusiasts, a small glass-top table with four chairs conveniently awaits. Keep climbing and you will reach the air-conditioned media room. This is the ultimate den, with Bose sound system, huge plasma-screen satellite TV and DVD player. Kick back on the comfortable brown suede sofa and watch a movie, or take a seat on the balcony and enjoy birds-eye views across the palm trees to the ocean. The focus of attention by the 12-metre green-stone swimming pool is undoubtedly the large Buddha-head statue that quietly contemplates the immaculately manicured lawns surrounding it. 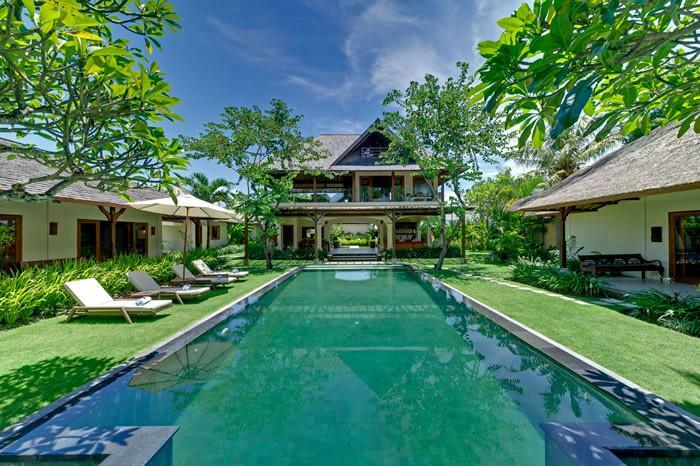 Here guests can absorb the villa’s peace and tranquillity by putting their feet up on the reclining sun loungers, perhaps after a game of tennis on the villa’s shared court. The gardens are just heavenly: frangipani and palm trees sway in the breeze, while red dragonflies dart amongst the vibrant heliconias and fish meander through the waters of the tranquil pond. 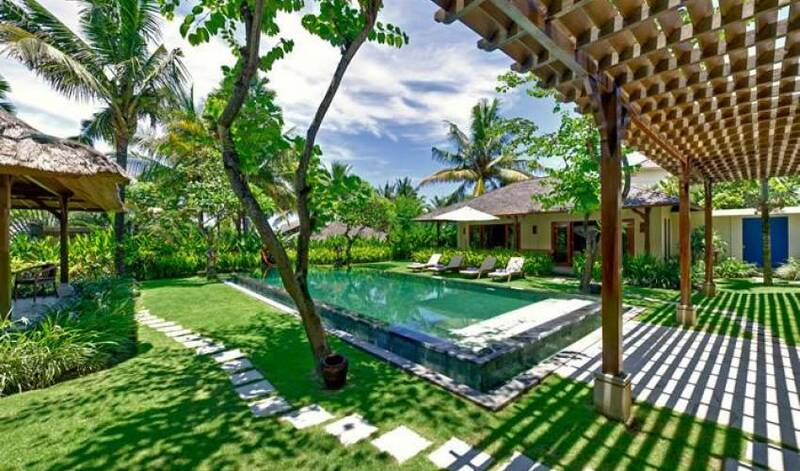 All four air-conditioned bedrooms at the villa have pool or ocean views and are tastefully decorated with Javanese antiques. Ceiling fans provide an alternative cooling option (except Master Suite 1) and all four rooms feature deluxe ensuite bathrooms. 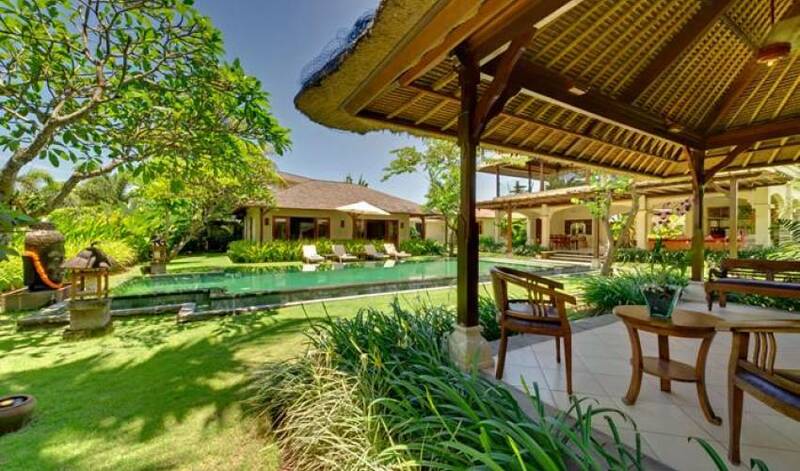 The upstairs master suite is accessed via the games room and offers views through the palm trees to the ocean and across the terraced rice fields to the peaks of magical Mount Batukaru. It features polished teak floors and a queen-size bed with wooden bed head, suede panels and a Javanese oil painting beautifully displayed in the centre. Large cupboards provide ample hanging space while black and mustard cushions contrast beautifully against crisp white linens. Guests will find it hard to resist the jacuzzi bath, from where they can watch rice farmers tending to their fields as clouds sweep over the distant mountains. 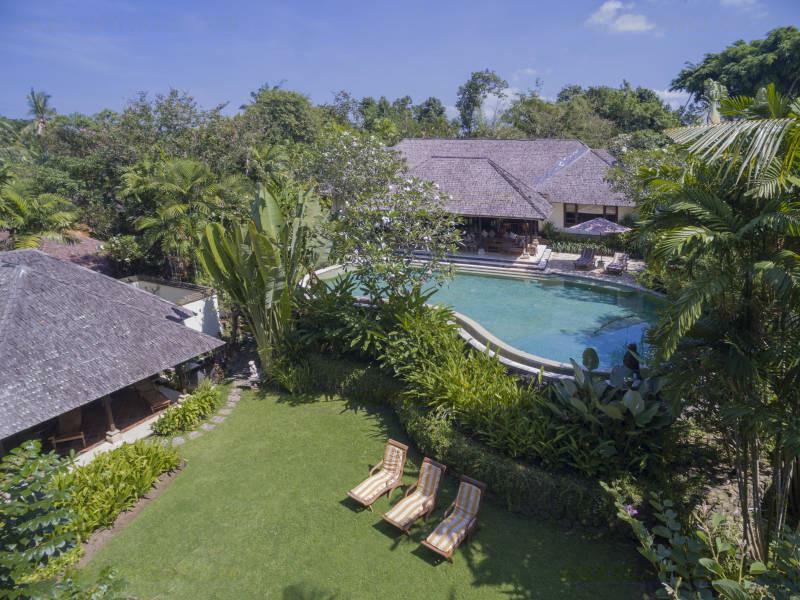 Designed for those seeking extra privacy, the second master suite is the perfect romantic hideaway with its traditional alang-alang roof, polished teak floors and luxurious bathroom. Featuring an exquisite Javanese writing chair and dresser, this king-bedded room also has a wooden bed head with suede panels and an oil painting displayed in the centre. A dark red feature wall provides a window seat should guests wish to curl up with a good book, and glass sliding doors open to a veranda overlooking the pool. Bathing is an absolute treat in the impressive bathroom featuring twin basins, indoor shower and jacuzzi bathtub with windows that open out to a secluded garden. An open-air shower is is also provided for those wishing to bathe beneath the stars. These two gorgeous guestrooms sit side by side under an ironwood roof. Cream tiled floors and glass sliding doors open onto a veranda overlooking the pool. Both rooms feature whitewashed teak furniture including a four-poster king-size bed draped with mosquito netting and an antique-style settee. Beautiful burnt-orange and mustard-yellow silk furnishings differentiate the two. The semi-open bathrooms with overhead showers are enclosed within small gardens. 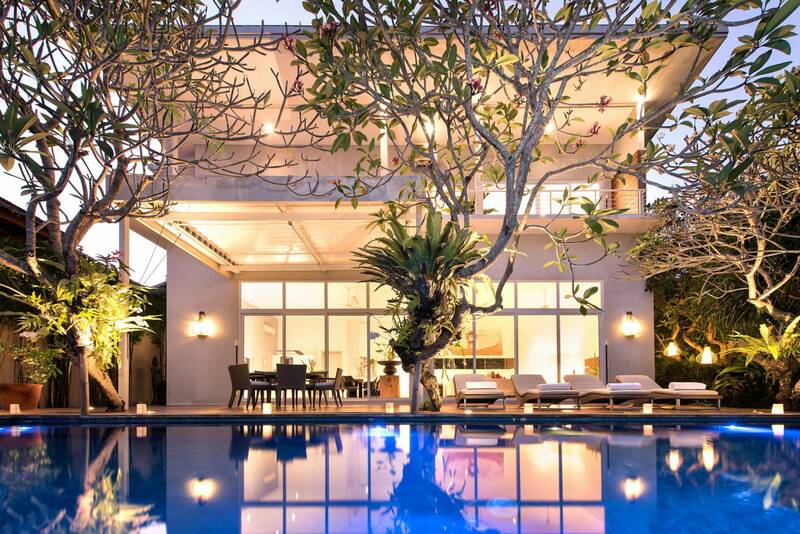 Villa Asmara is situated about 100m away from the sea on Bali’s south-west coast, just beyond the sleepy village of Cemagi. The glistening black volcanic-sand shores and rocky outcrops are also home to the small, but picturesque sea temple of Pura Gede Luhur Batungaus. While strong currents make the water here unsuitable for swimming, there are plenty of rock pools to explore and seaside walks to be had. 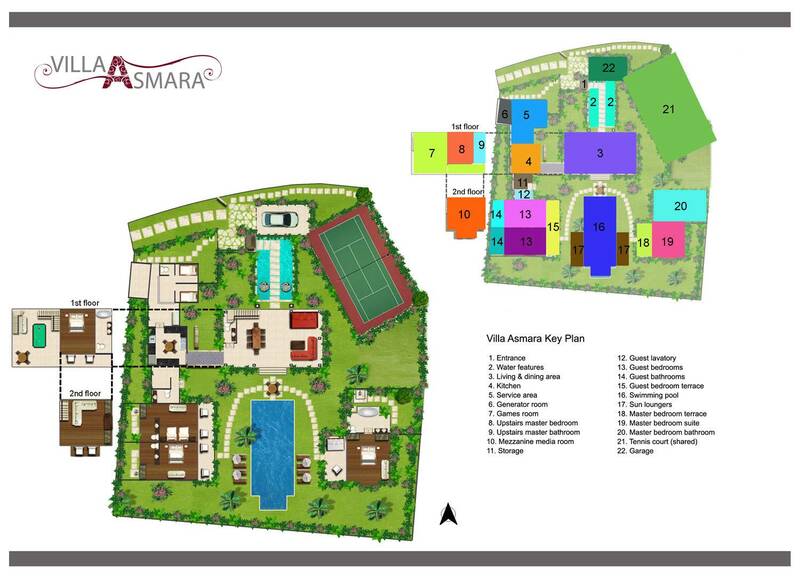 Despite its rural setting, the villa is only 30 minutes’ drive from the many restaurants and shops of cosmopolitan Seminyak. World famous Echo Beach is also within easy reach (10 minutes by car), where guests can enjoy the laidback surfer vibe, an ice-cold beer and some incredible sunsets.